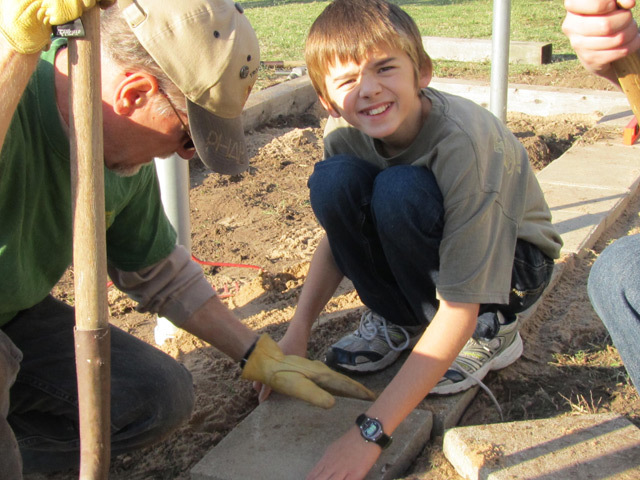 Public Service Company of Oklahoma employee Gerald Steele (left) and a helper lay stepping stones at the Salvation Army Boys & Girls Club in Broken Arrow, Okla. Kids on horseback, kids with new socks, a safe place to play, food for those in need and beautified landscapes for communities to enjoy were among outcomes of a dozen Make a Difference Day projects in six states coordinated and implemented with AEP employee help this year. More than 65 active and retired AEP employees and scores of community volunteers collectively completed the projects during Make a Difference Day, a national day of doing good sponsored each October by USA WEEKEND magazine in partnership with the HandsOn Network. The projects were funded in part by AEP mini-grants of up to $300 each, and required at least five active and/or retired AEP employees to help plan and participate in each program. Public Service Company of Oklahoma (PSO) employees joined Scouts from Troop 995 to make improvements around the Salvation Army Boys & Girls Club in Broken Arrow. By joining forces, the 17 adults and youth were able to build a long-awaited fire pit as well as enhance the landscape around a trio of new flag poles near the facility’s sports fields, said Cayti Burch, engineering technologist, Fossil & Hydro Generation, who helped coordinate the project. The club director was very excited about the improvements, Burch said. “She’s looking forward to weenie and marshmallow roasts for the kids and during fellowship.” The Scouts earned community service hours for rank advancements. About 200 youth and their families – including inner-city children and children with autism — sampled a bit of life in the country during the Field of Dreams Farm fall festival near Blacklick, Ohio. With funding from co-sponsor Kohl’s Department Stores, the event provided a chance for the non-profit Dreams on Horseback program to share its experiential learning with horses for disadvantaged and disabled youth through educational and equine-assisted learning sessions, according to Suzanne Priore, principal communications consultant, AEP Ohio, who coordinated AEP’s participation. Fort Wayne, Ind. — Volunteers from Indiana Michigan Power and Trees Indiana joined to build a footbridge at the entrance of Cedar Canyon Elementary School’s AEP Nature Explore Classroom in Fort Wayne and plant trees around the site. The Nature Explore Classroom is designed to enable youth from throughout the region to connect with nature. Shreveport, La. – Southwestern Electric Power Co. (SWEPCO) employees along with volunteers from the Greater Shreveport Chamber of Commerce Leadership Team and the Quota Club of Shreveport built a patio and barbecue area for Highland Haven residents. Highland Haven is a program of the Volunteers of America that provides housing for young women who have aged out of the foster care system, providing them an opportunity to become self-sufficient as they enter adulthood. Shreveport, La. – SWEPCO employees and volunteers from Louisiana State University at Shreveport and the community provided maintenance and cleaning at the Right to Play inclusive playground. Volunteers repaired blocks in walls, set new decorated bricks in walkways, removed graffiti, replaced loose fill rubber surfacing under playground equipment, pruned trees and planted new plants around the facility, designed for accessibility for children with physical limitations. Pataskala, Ohio – AEP employees teamed with members of the Licking Heights High School National Honor Society to college unused toys and gently used books for delivery to Nationwide Children’s Hospital and the Ronald McDonald House in Columbus. Collinsville, Okla. – PSO employees and volunteers from Ward-Wiseman Animal Haven joined to construct an indoor/outdoor enclosure in which rescued and surrendered cats can play, socialize and heal. Ward-Wiseman is a community-run, volunteer-based, no-kill animal shelter. Tulsa, Okla. – PSO employees and members of the ACE Team collected items for holiday food baskets for 10 of the neediest families at Central High School, PSO’s partner school. Each family received a full Thanksgiving dinner including turkey and ham as well as other food items for their pantries. Tulsa, Okla. – PSO employees collected basic furnishings and supplies for Lindsey House, a short-term residence for homeless women and their children operated by Transitional Living Centers of Oklahoma. The collection provided home essentials such as kitchenware, silverware, towels and furniture for families living at the residence. Roanoke, Va. – Appalachian Power employees collected non-perishable food items as well as meats for donation to the local Ronald McDonald House. The facility prepares a daily dinner for up to 40 people staying at the residence while their children are hospitalized. Gallipolis Ferry, W.Va. – AEP employees and retirees from Gavin and Amos plants joined Beale Elementary School staff, students and parent volunteers and school partner Letart Sand and Gravel to landscape a portion of the school grounds. Their efforts were acknowledged on the school sign which itself featured updated landscaping. Hurricane, W.Va. – Members of the West Virginia chapter of Women’s International Network of Utility Professionals (WiNUP) chapter from Appalachian Power’s Charleston and Hurricane facilities as well as Amos, Kanawha River and Gavin plants were joined by APCo President Charles Patton in delivering help to two distinct groups. The volunteers distributed warm winter socks to all 490 students at West Side Elementary School in Charleston. The volunteers also distributed blankets to families staying at the YWCA Sojourner’s Shelter in Charleston. Sojourner’s provides emergency shelter and supportive services for homeless single women, women with children, men with custody of their children and intact families. Point Pleasant, W.Va. – Employees from Mountaineer, Sporn and Gavin plants collected new and used musical instruments and cash donations for refurbishment of instruments to be used by children in need through Burlington United Methodist Family Services, a non-profit providing innovative services to children and families in need in West Virginia.